Last night’s nearly full house at the Community Academy Public Charter School on First Street in Bloomingdale was the first of eight Town Hall events put on by the Gray Campaign to help unite the city behind the democratic party candidate for mayor. Following Gray’s campaign mantra of uniting the city, the event last night was part Q&A, part pep rally, and though it started late, it didn’t underdeliver in terms of access to the candidate. When prompted on multiple education questions he deftly avoided the name of Chancellor Rhee, he didn’t mention her once, but still trumpeted his support for district-wide school reform under a strong chancellor. The tea leaves are still quite chaotic in the education space for the mayor-to-be, and though he endorsed reform through collaboration last night, he also endorsed a strong office of the Chancellor of DCPS, which is a relief to many. What the plan will look like come November is anyone’s guess. 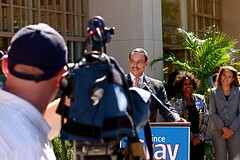 Gray also focused on the hard realities that await the Mayor and the Council in 2011 with regard to a huge budget deficit, and is opening a discussion, through these town halls, to take a long hard look at community priorities in the DC budget. We heard pleas from social services workers in the audience to keep their funding intact, and Gray was very honest with the crowd last night that tax increases are on the table when it comes to making ends meet in the District. Overall, I thought the event was a good thing for the District, at least for its second hour. The first hour was too much a party for those who worked hard to elect Vince Gray to the nominee’s position, and while I can respect that to the victor go the spoils, it was a lot to swallow if you weren’t one of the people who voted for Gray. If this is a tour about listening, and I believe that it can be, it’s time to ditch the cheerleader stuff and focus on the important parts: what the community needs. I don’t think it was Gray engaging in those antics yesterday, that was mostly Councilman Thomas, but it’s a presence that detracts from the unity message.